Just a thirty-minute train journey from Shanghai, the city of Suzhou in China has a number of tourist attractions plus some very nice bars to chill out in after visiting them. As with many places around the world, the city has embraced the growing craft beer revolution. Steve Rogerson visited some of the bars in autumn 2018 to find out what to expect. The Chinese city of Suzhou is one of the oldest towns in the Yangtze Basin with a history that is more than 2000 years old. Known for its beautiful gardens, many of which survive to this day, the modern version of the city also boasts some interesting bars. Sadly, a couple of the better ones – Jane’s Pub and Bookworm in the Shiquan Street area - have closed recently but others have popped up to take their place. This is in the ground floor of the Li Gong Di International Youth Hostel at the south side of Jinji Lake. There are 15 beers on draught – many of them local – and a bottled range. The pub is in one room with an outdoor seating area. Most seating is on high chairs round wooden tables, plus stools at the bar. It has a reasonable pub food menu. They have another outlet to the west of Suzhou. 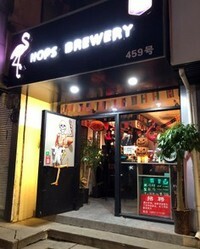 A short walk from Xinghai Square metro station, this is a combined bar and restaurant that brews its own beer. It has seven different beers ranging from pilsners and pale ales to a very nice stout. Opposite the Suzhou Exhibition Centre, this is a downstairs bar inside the I-Station mall. It is a small music pub with a few craft bottled and draught beers. Seating ranges from armchairs to bar stools. This is one of a chain of five in Suzhou that has more than 400 craft beers available. There is a wide range of international bottled beers plus some local ones. There are also six local beers on draught. A large sports screen and pool table provide entertainment. This is a small pub with a brewery in the basement. Six of their twelve home brew beers are on at any one time, and all only available on draught. Opened in 2018, its recommended beers include the 6.0% Milk Stout, the 6.5% Double IPA and the 5.,2% Red Ale. Avoid Pattaya opposite the pub – this is a brothel pretending to be a bar. This is a sports bar with two dartboards, pool table and a big screen for showing sports. The draught beer is Asahi, Carlsberg and Hoegaarden, but there is a better selection in bottles including local beers and Belgian classics such as Rochefort, Delirium, Chimay, Duvel and Vedett. There are also bottles of Erdinger and Paulaner from Germany. Its small stage sometimes hosts live music. This is an upstairs bar, but with live music. Next door to what was Jane’s Pub, it has a limited range of bottled beers, some local and some imported, such as Erdinger from Germany.